The Maverick 1 is a third-party controller manufactured under the QuickShot brand. 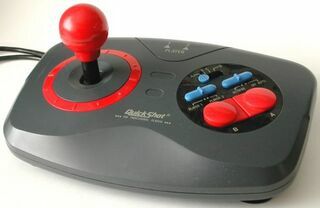 It is compatible with various home computers of the 1980s and the Sega Master System. The Maverick 1 is an arcade stick-esque device with two buttons, a joystick and turbo features. It can plug into both controller ports, and has a switch to change between the two players, saving the need to unplug the device if users want to share. In Brazil it was licensed by Tectoy as an official product. The Maverick 2 was a Nintendo Entertainment System accessory, but the Maverick 3 was a Sega Mega Drive one.